Tenn Well Passport wallets is waterproof fabric cover material . 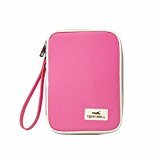 In addition, this Tenn Well Passport holder with slots for bank cards, ID Card, Passport, portable pen, cash ,coin ,ticket, boarding card, shopping invoice, ect . Don’t hesitate! Your travel would definitely love it! -Product dimensions: Approx 21.5*13.5*2.5cm (Zipped); 21.5*30*1.2 cm wide open (unzipped). -Material: waterproof fabric cover material .